I love weekends, especially if we don’t have anything planned. This weekend was one of those. We ate, relaxed and chatted and pretty much planned Nikolas’ birthday party in under 1 hour. I am not a good planner. I can never plan ahead of time. Yes, I am one of those moms that likes everything to be perfect, but wouldn’t plan ahead, but stress the day/night before. I love to entertain, cook and have people over. It’s in my blood I think. Speaking of my blood, my dear cousin Silda, came to visit us this weekend. She is a PHD student at Univerity of Illinois Chicago. She’s been so busy and we haven’t seen her for almost 3 months (that is a long time especially since we live literally 30 mins away). The best part when Silda comes over is the cooking. We miss our mothers’ food and try to improvise by making their dishes. 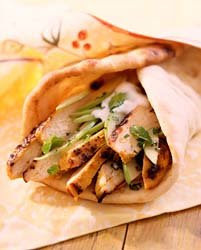 Today we had grilled chicken gyros with yogurt tzatziki sauce, oh yes, the best! We love to cook but we love the most the aftermath, the sitting on the couch or the napping (which is absolutely necessary to digest all that food). I don’t think Monday should be here just yet! How can we even top this food next week? The post The Weekend appeared first on Le Papier Blog.